The wait is over for devout members of the BeyHive, who are aware of the humble beginnings of Beyoncé and Destiny's Child as the group called Girls Tyme, which Beyoncé headed with fellow Destiny's Child members Kelly Rowland and LaTavia Roberson and former Prince protégé Ashely "Tamar" Davis. Girls Tyme The Untold Story of Destiny's Child has arrived. 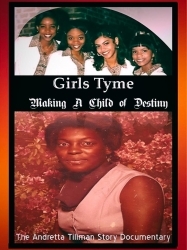 Houston, TX, February 20, 2018 --(PR.com)-- The newly released Documentary “Girls Tyme - Making a Child of Destiny (The Andretta Tillman Story)," shares never before seen interviews from key people who influenced Beyoncé and Destiny’s Child on their rise to fame. The documentary includes clips of rare unseen performance footage of the Flawless star and the rest of her Girls Tyme crew.